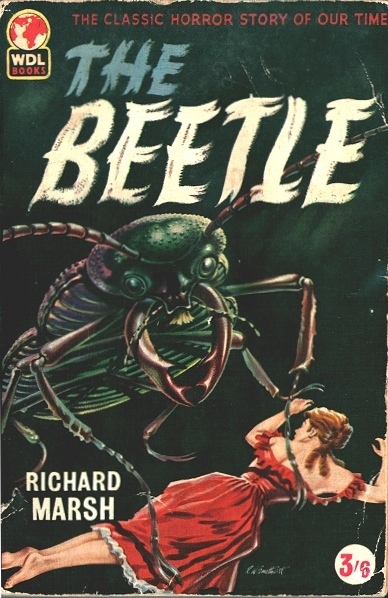 Richard Marsh’s The Beetle is certainly one very bizarre and outrageous book. It’s included in Victorian Villainies, which includes four Victorian mysteries, elected by Graham Greene and his brother Hugh. It’s actually a short novel. Although it’s a mystery it contains very definite elements of the gothic, it involves supernatural or apparently supernatural events, and there’s some horror. It was written in 1897, and it highlights some of the obsessions of that time period. Hypnotism plays a major role, and (of course) a sinister one. There’s also the Mysterious East. And devilish foreign cults involving human sacrifice – the favoured sacrifices being (naturally) white Christian women! That part is probably influenced by the British experience with the Thugs in India, and their sacrifices to Kali. Ancient Egypt also plays a key role – the devilish cultists are the Children of Isis. They bear no resemblance whatsoever to anything that ever happened in Ancient Egypt, but they do give some idea of how the Victorians imagined Ancient Egypt. The plot is too complicated to explain, except that it involves a member of parliament haunted by an event in his past, a derelict house with a strange inhabitant, and a romantic triangle. There are mysterious disappearances, there are people who can transform into scarab beetles (hence the title), and there are nameless horrors. It’s extremely complicated in structure (like so many 19th century novels) with no less than four first person narrators. It’s all very breathless, but it’s also highly entertaining. I liked it. At the time it apparently outsold Bram Stoker's Dracula, published in the same year. John Farris has written an enormous quantity of fiction of various types during his lifetime. He started his writing career at a very young age with a number of hardboiled crime novels, including Baby Moll (published in 1958 when he was 24). Baby Moll is a fairly stock-standard hardboiled tale, owing a considerable debt to Hammett. Pete Mallory was a gangster, but eventually decided the life of crime was just not worth the rice. So he retired and bought himself a sporting goods store in a remote town. And he met Elaine, and they became engaged. He’d just about got to the stage where he was no longer reaching for a gun at every sudden noise, and was actually able to to just enjoy himself sitting and fishing. And then his past came back to reclaim him. His old gang boss, Macy Barr, is also being haunted by his past. Years earlier when he was getting started in the protection racket he’d had to teach a recalcitrant store-owner a lesson. The store-owner and his entire family perished in the subsequent fire. Well, not quite. There was one survivor. And now all of the hoodlums involved in that incident are being hunted down and killed, one by one. Macy Barr is getting old, he’s losing control of his crime empire, and he’s scared. Not just for himself, but for a young orphan girl he’s adopted. Macy has finally found the ability to care for another human being and he’s not ready to die yet. His one chance is to persuade his old right-hand man Pete Mallory, to help him out. If anyone can find and stop the killer it’s Pete Mallory. Pete wants no part of that old life, but he owes Macy a big favour. At a time when he was just about ready to give in to despair and give up on life Macy had forced him to pull himself together. He owes Macy his life, and it’s a debt he has to repay. Macy is holed up on a island fortress with an odd collection of goons, family members and assorted hangers-on. All kinds of sexual and emotional dramas are being played out on the island, but Pete has to try to keep himself as free of these entanglements as possible. Which isn’t easy, especially with beautiful naked women wanting to get friendly with him. Pete is good at his job but the situations continues to spiral out of control, and corpses keep accumulating. The story builds to a very dark finale. Baby Moll isn’t one of the great hardboiled classics but it’s stylish pulpy entertainment. There’s as much seediness as you could wish for, quite a bit of sleaze and lots of desperation. Macy Barr is an interesting creation, a vicious crime boss with some surprising human weaknesses, a character you can both hate and yet for whom you can feel a strange compassion. Farris doesn’t add very much to the genre (unlike other writers of the time like Jim Thompson) but at the age of 24 he’d mastered the basics of the style pretty effectively. It’s a fine well-crafted example of its type and its re-issue in the Hard Case Crime series was extremely welcome. I’m continuing my exploration of French pulp fiction of the late 19th and early 20th centuries. 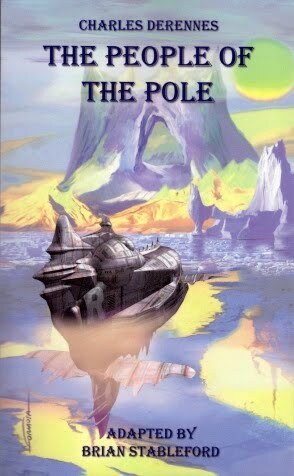 This time it’s The People of the Pole (Le peuple du Pôle), a science fiction adventure tale by Charles Derennes. Published in 1907, this is a lost world tale, a genre I’m quite fond of. This one adds quite a few original twists though. A bored and wealthy young man, Jean-Louis de Venasque, has been seeking an outlet for his yearnings to journey to hitherto unexplored places. By great good luck, or possibly ill luck, he meets a brilliant but penniless engineer named Jacques Ceintras. The engineer has designed a new kind of airship, an airship capable of undertaking immensely long aerial voyages. And de Venasque has a destination worthy of this formidable ancestor of the zeppelin - the North Pole! They reach the polar regions, but there is a surprise in store for them. They find not a world of ice, but a strange world filled with animal and plant life. Life forms cut off from contact with the rest of the world since the days when giant reptiles roamed the earth. So far the story sounds like a conventional enough lost world tale, but now Derennes introduces his first twist. These reptiles from an earlier geological age have not merely survived, they have continued to evolve. They have evolved to the point where they have developed not merely intelligence, but technology and civilisation. This is a civilisation with very different values from human civilisation, a civilisation with a very different approach to the question of the sanctity of life and the importance of the individual, and Derennes uses this to offer some social commentary on our own beliefs about these subjects. Their technology is also rather different, and their polar world is illuminated by a an eerie kind of artificial sunlight. Relations between the two explorers have become increasingly tense, and this situation worsens when they make contact with the reptilian civilisation of the polar region. The inherent difficulty of communication with intelligent creatures radically different from ourselves makes it impossible to make real and meaningful contact with the reptile people, while Ceintras’s increasingly erratic behaviour causes outright conflict. This first contact with a very foreign culture is not destined to end happily. And now Derennes throws us another twist. The main narrative is ostensibly a diary kept by de Venasque, and Derennes now suggests that de Venasque may be a very unreliable narrator indeed. He hasn’t finished playing games with the reader though. After casting doubts on de Venasque’s account of the voyage he then suggests that maybe we should discount those doubts. He leaves us with a doubtful narrative but with the certainty that the voyage of the two aeronauts really did take place, and they really did reach the Pole. The remaining doubts concern what they actually found there, and what their own actions actually were. For what seems on the surface to be a somewhat pulpy scientific romance The People of the Pole has a surprising degree of literary subtlety, and literary polish as well. It’s also an entertaining and fascinating adventure tale. And it has zeppelins. What more could you ask for? It’s published by Black Coat Press, and easy enough to get hold of if a trifle expensive. 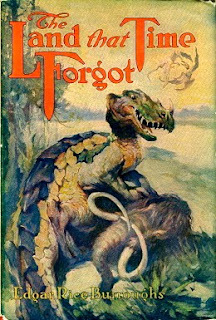 Edgar Rice Burroughs wrote his Caspak Trilogy, starting with The Land That Time Forgot, in 1918. It became an instant classic of the Lost World genre of adventure fiction. It also happens to be one of the strangest of all Lost World tales. These days the word trilogy has taken on an ominous quality. We imagine immense volumes the size and weight of house bricks. The whole of the Caspak Trilogy however amounts to no more than a relatively short novel. It comprises three very short novels, The Land That Time Forgot, The People That Time Forgot and Out of Time’s Abyss. Each of these three novels recounts a different series of adventures, with different protagonists, on the mysterious island of Caspak. The three separate narratives are drawn together at the end of the final volume. The Land That Time Forgot takes place in 1916. A steamship is torpedoed by a German U-boat. The only survivors are a young woman named Lys and a man named Bowen Tyler who, in one of life’s little ironies, is an American engineer who designs submarines for various navies including the Imperial German Navy. These two survivors are picked up by an ocean-going tug that later encounters the very same U-boat, and through a mixture of luck and daring the crew of the tug ends up capturing the U-boat and its crew. Their attempts to sail the submarine to England are thwarted by the efforts of a communist agitator and they end up hopelessly lost. It seems their troubles might be over when they make a landfall, but the large island they have found is a very bizarre island indeed. It was originally discovered by an obscure 18th century Italian explorer. There is only one means of reaching the interior of the island, by navigating the U-boat through an underground river. The island is in the polar regions but the interior is warm and covered in lush vegetation. It’s also inhabited by long-extinct animals including dinosaurs, and a variety of creatures that are either human-like apes or ape-like humans. So far it’s your standard lost world scenario, but as our heroes progress northwards through the island they find the animals, while still long extinct elsewhere, are increasingly modern. And the man-like creatures are closer and closer to modern humans both anatomically and culturally. The explanation for this odd evolutionary continuum, and for the the absence of any children, is a tour de force of imaginative weirdness which I don’t intend to spoil for you. The first book gives us Tyler’s story. The other two books follow the adventures of a rescue party sent to find Tyler, and of another party separated from the original band who arrived on the submarine. The whole trilogy is a fun pulpy tale of encounters with terrifying creatures, of improbable escapes and dashing heroism, and of three unexpected love stories. It’s the truly strange nature of Caspak itself though that is most disturbing and most memorable. If you like your weird fiction with extra weirdness then this certainly qualifies.